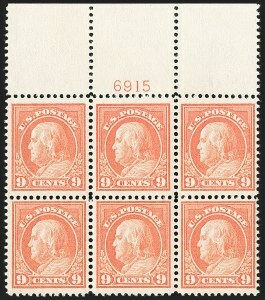 In December 1914 the Kansas City post office had an oversupply of imperforate stamps, originally intended for vending machines. 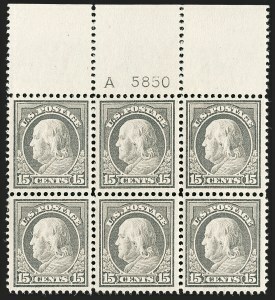 The supply of stamps was rouletted with women's dressmaking tracing wheels, and official approval for their release was given by the Post Office Department in Washington. 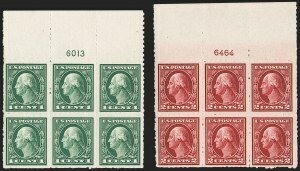 There is a simple way to differentiate between the two 50¢ Violet Perf 12 1914 Issues, Scott 421 (single-line watermark) and Scott 422 (double-line watermark), without even looking at the watermark. 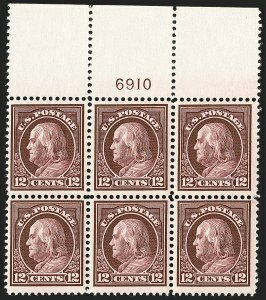 Scott 421 almost always has printing ink offset on the gum (unless it is regummed), and Scott 422 never does. 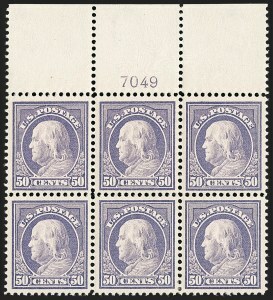 As a measure of rarity, the Wampler collection had a hinged top plate block of Scott 421, and the Fogelson collection did not have a plate block (both sales were held by Shreves Philatelic Galleries). Our sale of the vast "MLG" collection also did not contain one. The only other top plate block we have offered with full or nearly full selvage was in our 2015 Curtis sale. 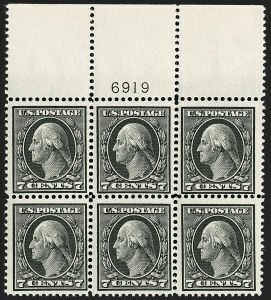 Lewis Kaufman records only five full top plate blocks available to collectors (excluding the top position in the Miller collection owned by The New York Public Library). 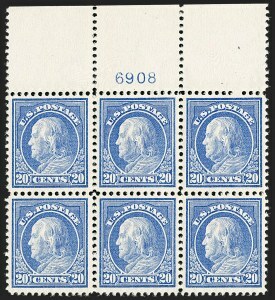 There is a simple way to differentiate between the two 50¢ Violet Perf 12 1914 Issues, Scott 421 (single-line watermark) and Scott 422 (double-line watermark), without even looking at the watermark. 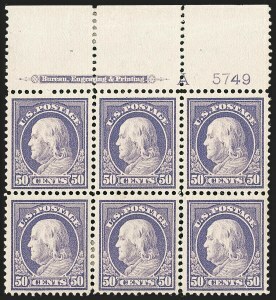 Scott 421 almost always has printing ink offset on the gum (unless it is regummed), and Scott 422 never does. Lewis Kaufman records only nine full top and five bottom plate blocks.